Gunung Panti Recreational Forest is a relatively large area that contains several hiking options. This hike leads up the largest hill in the area, Gunung Panti itself (520 metres). The up and down hike can be completed in a day, but it is also possible to camp at the top. On the other side of Gunung Panti Recreational Forest is the Kota Tinggi waterfalls hike – another trip which can be done as a single day hike or an overnight trip. The hike from the Kota Tinggi road to the summit is approximately 10 kilometres. Up to 5 kilometres of this can be cut out by taking local transport down the narrow roads towards the palm plantation at the base of the hill. Otherwise, the roads are flat and easy to walk, if not particularly interesting. The hike proper starts at the end of the palm plantation and the start of the forest, and climbs rapidly up a rocky channel. This is hot, sweaty jungle and there are many leeches – especially after rain. 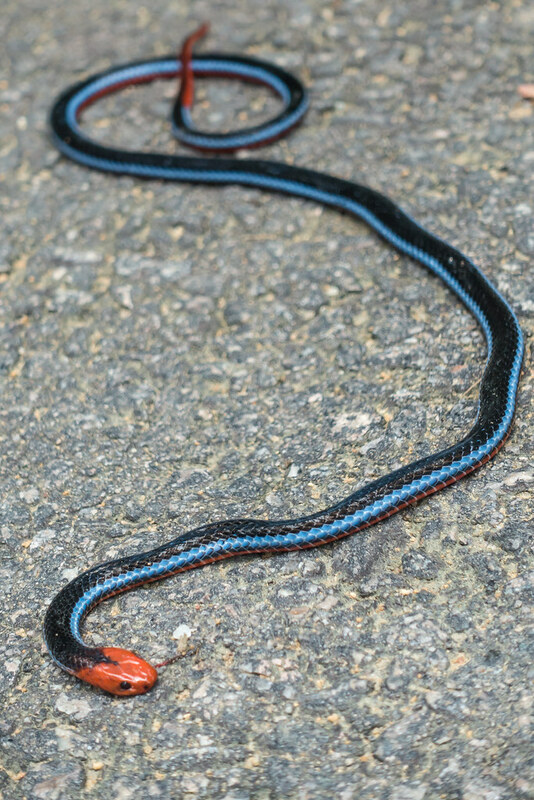 We were also lucky enough to spot a Malayan Blue coral snake on the road just before the forest, and there are surely many more critters in jungle. The hike to the summit is steep at first but quickly becomes easier, and shouldn’t take more than 3 hours. The descent took us another 2 to 2.5 hours. There is only one mildly difficult section – a steep rock face which requires some hauling using a rope attached to a nearby tree, but this is over as soon as it begins. Although the hike to the summit and back again can easily be achieved in a single day, camping at the summit provides the best experience, with beautiful views over the surrounding forest through the morning mist. It is essential to take all supplies and equipment with you, as nothing is available on the mountain – not even water. In Malaysia’s climate, 5 litres of water should be an absolute minimum for an overnight trip like this. It can also get a little “cold” and damp during the night, so an extra layer might be necessary. Overall the Gunung Panti hike is not extremely difficult, but the intense heat and humidity – as well as the weight of supplies if you are camping overnight – should not be underestimated. An easier walk in this vicinity is the trail to the waterfalls outside Kota Tinggi. 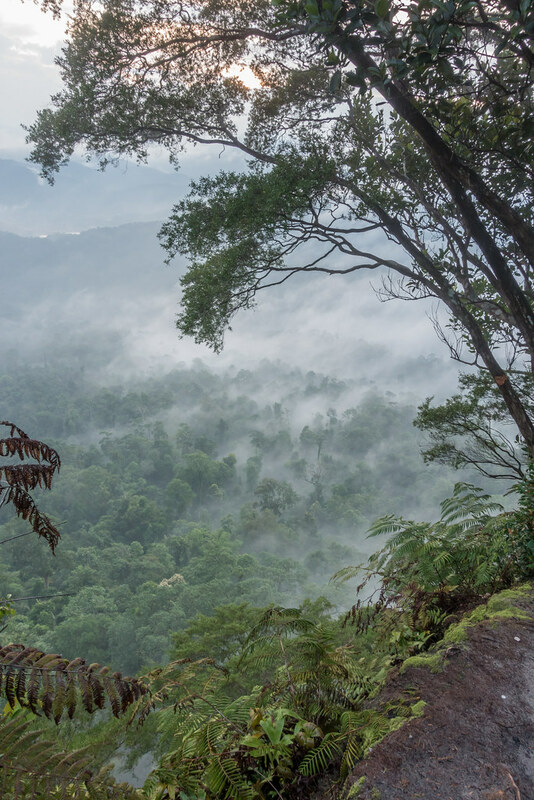 Gunung Panti forest reserve offers a strenuous but short hike to the mountain's summit, with great views over the surrounding forest. Be the first to comment on "Gunung Panti summit hike"